Installing vinyl replacement windows is a smart home improvement project. But if prospect having your home opened to the elements leaves you feeling a bit queasy, there are some simple ways to prepare for the project. Effective, efficient window replacement begins by having a thorough discussion with your window installer, well in advance of the day the work is scheduled. A professional vinyl replacement window installer can ease concerns and answer questions, helping you to feel far more comfortable and ready for the window replacement activity. Here are ten things you can do to prepare your home and your family for a smooth and pleasant window replacement experience. Keep kids and pets out of the way. Kids, pets and contractors — they’re like oil and water. For safety’s sake, make arrangements to keep young children and family pets away from workers at all times. Carefully check windows and paperwork. Double-check the paperwork that comes with new vinyl replacement windows and the windows themselves. If you requested Energy Star qualified windows, make sure the stickers are on the window. If you asked for low-maintenance vinyl window frames, double-check to make sure you’ve received those vinyl replacement windows. And if you spot any broken glass or damaged frames, make sure to bring that to the attention of your window installer before the windows are placed in your home. Also make certain to save your window warranty information in a secure location. This documentation is also important to be able to claim replacement window tax credits. Arrange window storage and removal. 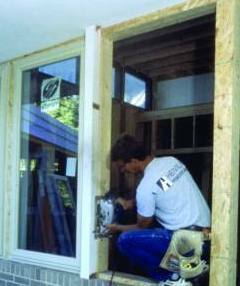 Discuss removal of your old windows with your window installer. During a replacement window project, either the new or used windows may need to be stored at your residence for several days. Show the team where to store new and removed windows, make sure they’re protected, and set a time frame for removal of old windows. Make a rain plan. Find out what your window installer’s weather policy is, and decide together on acceptable weather conditions for your project. While they may be fine working in the rain or snow, you may not want the interior of your home to get muddy and wet. Keep window installation zones clean. Be sure to ask about cleanup, because there’s a fair amount of dust and mess that accompanies a replacement window project. Discuss beforehand whether furnishings should be covered during the installation process and what the company’s policy is for cleanup both inside and outside the home following installation . If you communicate with your window installer in advance about concerns and expectations, the vinyl window replacement process can go quite smoothly for both you and the installation crew. For more information about vinyl replacement window installation, check out Energy Savers’ window installation guide or The Money Pit’s Complete Window Replacement Guide. My front window is broken, and I need to get it fixed before winter. I agree that you should get help from a professional. I would also recommend getting your window fixed by someone that is licensed and insured. Recently I found a crack in one of my windows. You’d be surprised how much my energy efficiency has dropped. I need to replace it, but I don’t know if I should be the one doing the installation. I’m not even sure how to remove the existing window. What do you suggest I do?